Higuer!, but beware of the roof! I feel like Dicaprio. Several reddit.com users have linked an article on my blog here and the num. 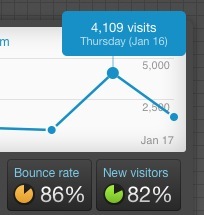 of visitors has grown as you can see in the graph. I'm still freaking out!. Thanks! Clearly that will not be repeated again, but has encouraged me to make an article that many people have asked me by e-mail: Review of the RetroPie guide I published in March last year and possibly the article with more visits I've achieved since I started the blog. By the way, we're very close to 200,000 visitors. There will be surprises and contest!.